Hit a Home Run With our Top 10 Key West Attractions Guide! There are many Key West attractions and activities that you will want to experience when making your first vacation to this island getaway. We have assembled for your convenience a list of the top 10 attractions in Key West. This list of things to do in Key West contains attractions and activities that you will definitely want to put on bucket list of things to do while on vacation. These vacation tips will help make your trip more memorable and help insure you will make the most out of your vacation. At the top of our list of Key West attractions are the Key West restaurants. The town is known for it's ever expanding list of fine restaurants, many of which cater to a Caribbean theme. However it stands to reason that the number one attraction for many of the areas restaurants is seafood.The abundant fresh seafood available makes this tropical retreat the perfect seafood lovers paradise. Make sure to stop by the A&B Lobster house if you want to experience the freshest seafood on the island. 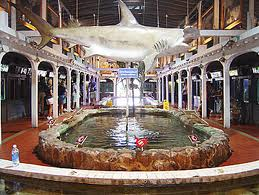 Be sure to check out the feeding of the Tarpon, which takes place every day at 4:00 in front of the A& B Lobsterhouse. Trust us when we say you'll be amazed. You for sure will want to take advantage of the many happy hour specials that many of the restaurants will offer. Most of the restaurants will have happy hours that run for a period of two hours, usually between 4:30 and 7:00pm. Our personal favorites are all located at the Old Historic Seaport, mainly because of the incredible atmosphere that comes with the location. Our first choice is always the Commodores restaurant. Make sure you add them to your bucket list of things to do in Key West, you won't be sorry. Like all the restaurants at the seaport they offer open air dining right on the dock. They offer a fantastic selection of 1/2 price appetizers and 1/2 price drinks from 4:30 until 6:30 pm. You can buy a 20oz. Domestic beer for just $1.88 (no kidding) during happy hour and they also offer a huge selection of boutique beers at a dirt cheap price. This is also the hands down favorite watering hole for the local crowd. Two other restaurants we would recommend at the Old Seaport would be the Conch Republic and Turtle Kraals. Both offer 1/2 price appetizers and drinks. Their happy hours run from 5:00 to 7:00pm. Turtle Kraals offers a few barbeque options for their appetizers while the Conch Republic has more seafood choices. The Florida Keys with it's temperate weather is also one of the most famous locations in the U.S. for many water sport activities, including scuba diving. Key West diving is incredible with all the reefs and sunken ships to explore in the waters surrounding the island. 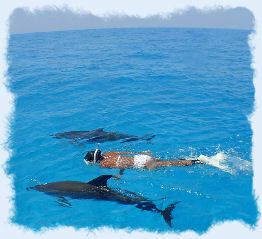 There are also a large number of companies that specialize in Key West snorkeling charters, echo tours and Key West dolphin encounters. All of which rank at the top of the ten best things to do in Key West list. Sunset Watersports would be hands down the best watersport outfitter we've found on the island for both jetski and boat rentals. 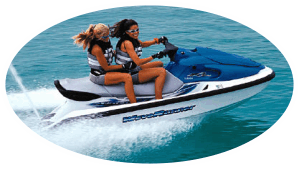 They not only offer the best prices we've found, they also replace their jetskis each year and update their boat rental fleet every few years. They consistently offer the best deals and maintain the highest trip advisor reviews. Sunset also offers the best deals we've found on the island for a guided snorkel tour, which takes you out to the many reefs surrounding Key West. You can book a 3 hour morning reef tour for only $35 and afternoon tours for only $40. Sunset supplies all the snorkeling gear and they even include FREE BEER and soft drinks as part of their package. For Kayak rentals in Key West our first choice would be the Lazy Dog. They offer great prices and they are our first Kayak rental choice mainly due to their great location. They are located at the Hurricane Hole Marina, which is situated next to a large area of mangrove trees. You will see a nice variety of fish and marine life in the mangroves. If you're real ambitious be sure to ask about taking the canal route. The canal route winds through the middle of Key West and returns you in a loop to just about the place you started. They will supply you with a map so you won't get lost. If you're lucky you may even spot a few manatees in the canal, which is one of the areas they hang out. A great second choice for a kayak rental for both convenience and price would be from Sunset Watersports at their Smathers Beach location, which is the number one beach in Key West. With it's balmy weather, Key West is also known as a great place to go for some beach fun. You would have to include a day at the beach on your list of top ten things to in Key West. 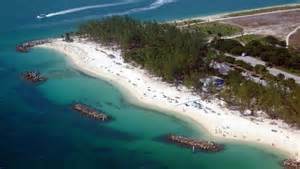 There are a number of beaches that are known for their variety of things to do, including it's largest beach, Smathers Beach. At Smather's Beach there are a host of watersport rental companies and many food & beverage vendors to keep you satisfied. Be sure to check out our Key West beach guide, including reviews. At Smathers beach you can rent just about anything associated with water sports including: jet ski rentals, parasailing, kayak rentals, snorkeling equipment, etc. 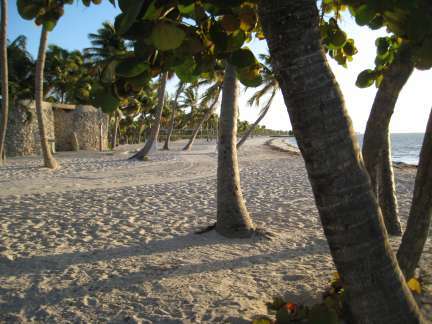 Smathers beach is also one of the number one most popular location for Key West beach weddings. Just down the street from Smathers is Rest beach. Rest Beach is a smaller beach with a rocky shore, but it does have a couple of stairs to access the water. If you want more seclusion this beach would be a good choice. Moving down the shoreline the next beach is Higgs Beach. We would consider Higgs Beach to be one of the better beaches for snorkeling due to the pier located there. The pier has a couple of stairs at different points to access the water. At the end of the pier there is a number of old wooden supports left standing in the water from bygone days that make for great habitat for fish and marine life. Higgs has a nice little open air restaurant located right on the beach. If you have a dive flag we would also recommend the stretch of shore between Rest Beach and Higgs Beach due to the coral restoration project that has been done in that area. Annex located on Southard St. The park charges $2 per head to access the beach area. The beach is considered by many to be Key West's finest beach. The beach has some of the best sand on the island and there are a couple of man made rock reefs that help break the surf. The rocks also make for a great snorkeling experience since they offer sanctuary for many different marine creatures. Fort Zachary beach includes a shower and changing area along with a nice little restaurant located on the beach. No list of top Key West attractions would be complete without mentioning the famous Key West bars and world famous Duval Street. Duval Street is of course legendary for it's nightlife and historical bars and easily qualifies as one of Key West's top ten attractions. 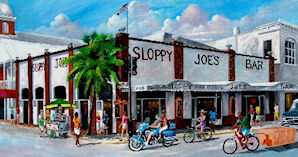 One of the most popular and historic Key West bars is Sloppy Joes, a bar often frequented by the famous writer, Ernest Hemingway. The bar always features lots activity hosts some of the islands best bands. Another popular Key West pub that you will want to put on your bucket list is the Green Parrot, a bar that dates back to over a 100 years. The Green Parrot still maintains it's old world charm and it gives you a glimpse back in time as to what an 19th century seaport was like. 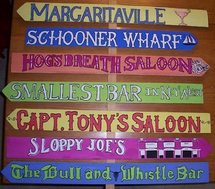 There are certainly many more great bars to choose from. It will take you many different trips to Key West to sample all that the island has to offer. Be sure to check out the happy hours that most of the islands restaurants & bars offer. For those of you looking for a beer bargain you can also find a number of little stores or shops along Duval that will offer a $2 or $2.50 beer. To be legal they will supply you with a cup that you can carry your beverage in while walking down the street. Thousands of people also make the pilgrimage to the island each year for one of the islands most popular attractions, Key West light tackle fishing. The waters surrounding the island provide some of the best sport fishing to be found anywhere on the globe. The waters surrounding the Florida Keys has the distinction of holding more Salt Water world record fish than any other fishing destination. a Key West Party Boat. 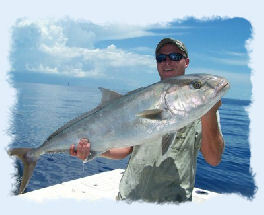 There is a good selection of charter boats eager to provide you with some fantastic fishing. By far the most affordable fishing option is to take advantage of the great prices offered by one of the Key West Party Boat Fishing Charters. The two most popular fishing charters include Key West flats fishing for the elusive bone fish, and possibly the most exciting of them all, Tarpon fishing. A close second would be Key West deep sea fishing. 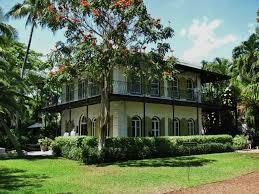 Ernest Hemingway virtually put Key West on the map with his account of his deep sea fishing exploits. Pursuing the giant Blue Marlin became a life long obsession of Hemingway. If you have a little salt water experience and plan on fishing for more than a few days you can save a great deal of money by renting a boat versus hiring a charter service. Offering the best boat rental prices we've found on a Key West boat rental is Sunset Watersports located at the Hurricane Hole Marina. They also do a good job of replacing their boats every few years. Our list of top ten Key West attractions also includes a round of golf at the Key West Golf Club. Golfing while in Key West may not be the first attraction that comes to mind when considering Key West's most popular attractions, but it should. The island features an 18 hole championship golf course designed by none other than the world famous golf course architect, Rees Jones. Rees Jones is best known for being the US Open doctor. He is responsible for more renovations of U.S. Open courses that any other architect. The Key West golf club just happens to be the only golf course option in town, but it's certainly a good option if you're a golfing enthusiast. If you're thinking about lugging your clubs along with you you may want to consider a rental set. The Key West Golf Club features a nice selection of newer Nike sets for you to choose from. The rate for a peak season round will set you back just short of $100 and their off season rate is around $70. 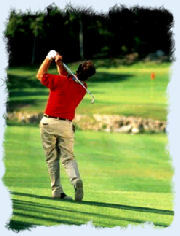 The golf course offers twilight rates and off season discounts. The course is located just over the bridge on stock island. 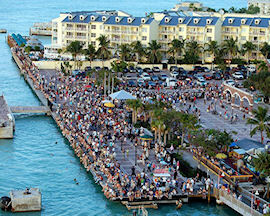 Mallory Square is for sure on every bodys list of top ten things to do in Key West. This popular Key West Attraction is where everyone goes to watch the famous Key West sunset. As your day winds down you're going to want to head on over to Key West's Mallory Square and take in all the festivities associated with the sunset celebration on the Mallory dock. This time honored tradition features a host of activities including many fantastic street performers, food vendors, merchants and arts & craft displays. You will find that this nightly festival is truly unique with no two nights being exactly the same! Many of the street performers offer some amazing and world class entertainment. Be sure and check out the street mimes if they are there, they are hilareous. Mallory Square is located just off of Duval Street on the western most end of the island. Be sure to spend at least one evening at this most popular Key West attraction. Another Key West attraction on every ones list of most popular Key West attractions is a trip to the Dry Tortugas. Approximately sixty five miles west of Key West lies a string of small beautiful islands call the Dry Tortugas. The islands have a lot of history including being a favorite hangout for pirates back in the days. The islands are the home of one of Americas earliest Naval Stations, Fort Jefferson. Fort Jefferson has stood for over 150 years and is one of the largest structures to be found anywhere with an estimated 17 million bricks. Since then the island has been made into the Dry Tortugas National Park and is a definite must see if you are going to be in the Keys. There are a number of shuttle services that will take you to the islands for a day trip or there are even overnight opportunities available. 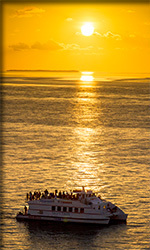 The most popular ferry service to the Tortugasa is the Yankee Freedom. The Yankee Freedom departs Key West daily at 8:00am from the Historic Seaport located at 100 Grinnell St. The trip is $170 for adults and $125 for kids. You also have the option (permit required) to spend a night camping on the island for just a few dollars more. They recommend you arrive at 7:00am to check in. Boarding time starts at 7:30am. 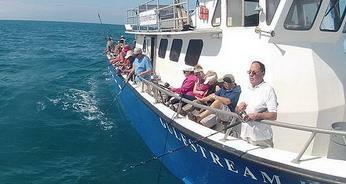 The trip takes a little over two hours to reach the Dry Tortugas. You will have approx. Five hours to spend snorkeling, exploring, and touring the historic Fort Jefferson. The Yankee Freedom will depart Fort Jefferson for the return voyage at 3:00pm and will arive back in Key West at approx. 5:30pm. No trip to Key West would be complete without experiencing one of the islands most popular attractions, a Key West sunset cruise or dinner cruise. This attraction easily makes our top ten list of things to do in Key West. There are many choices to choose when it comes to choosing a boat. You can even choose between an authentic 19th century sail boat to a sleek and modern vessel with all the comforts of home. Most of the cruise ships will offer a number of options depending on your budget. There are dinner cruises or the ever popular party boat cruises, where drinking seems to be the main theme. If you do a little homework you will find good deals due to the number of boats in competition looking for your business. Our first choice for a great value is offered by the folks at Sunset Watersports. Sunset if our first choice for almost any island activity when it comes to finding the best value. Unlimited Draft Beer, Wine, Mixed Well Drinks & Sparkling Champagne & Their Excellent Tropical Food Buffet. The island can become a little congested during the peak winter months and there is an abundance of convenient transportation available for you to get around. One of the cheapest and best ways to tour the island is to take advantage of the many Key West bike rentals or Key West scooter or electric car rentals. We highly recommend renting bikes to help you get the most out of your Key West trip. There's nothing better than cruising around a tropical island on a bike with a cold beer in your hand. You may want to take a cab home however if you partake in one of the famous Key West pub crawls. There is also a number of Key West tours and trolleys available that will take you around the island to view the islands many attractions. You will definitely also want to take a walk or bike ride through Old Town Key West if this is your first trip to Key West. The tiny streets are lined with historic architectures and incredible botanic displays. Most of the Old Town Key West residents in this historic neighborhood take great pride in their restored wooden homes and have a competition of sorts to see who has the best tropical landscaping. We have included a few more attractions that are worth mentioning when it comes to the best things to do in Key West. Although these additional attractions didn't make our list of the top ten things to do in Key West they are certainly worth considering depending on preferences. The Southernmost Buoy is not on the list of things to do in Key West but it's never the less one of the islands most popular attractions. 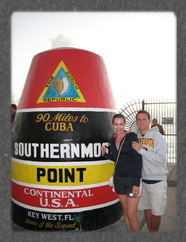 If you are taking your first trip to Key West then you may want to take the time to visit the Southernmost Buoy for a quick photo. It may be the islands number one photo attraction. The Southernmost point was originally designated with a sign. After numerous thefts of the sign in 1983 the city decided a two thousand pound buoy might be more difficult to steal. So far they've been right. The Buoy is located at the corner of Whitehead and South Street. The Ernest Hemingway Home and Museum made our honorable mention list of things to do in Key West simply due to the popularity of the famous author. The home was originally built in the 1850's and was refurbished by the Hemingway after purchasing the home in the 1930's. The home includes the first in ground pool which was built for a staggering $20,000 price tag in 1937. We would consider this attraction to be sort of a tourist trap. If you're a huge Hemingway fan or a history buff the Museum may be worthwhile. Otherwise the $13 admission fee is certainly way overpriced for entertainment value. For those of you that are nature lovers the Butterfly Conservatory Center should be on your list of popular things to do in Key West. This Key West attraction received very good reviews with Trip Advisor and was voted the number one attraction according to the peoples choice rewards. 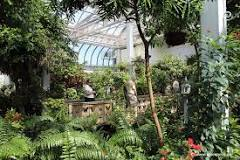 The Butterfly Conservatory includes a beautiful botanical garden area that contains up to 75 different butterfly species and a learning center. At the learning center you may view countless species of butterflies while learning all about various facts and interesting butterfly trivia. The Conservatory charges $12 for adult admission and $8.50 for children. Some people would consider this Key West attraction to be somewhat of a tourist trap, but many nature lovers feel it's well worth the price of admission. Their hours are 9:00 to 5:00pm and they are located at 1316 Duval St.
Another attraction worth mentioning is the Key West Aquarium. We would rate this Key West attraction fairly low on our list of things to do in Key West. The exception would be if you have young children with you and you are looking for something to do. The Aquarium features a number of small tanks that are home to a variety of fish and marine species. The Aquarium will give you a guided and short informative tour pertaining to the different species that they have on hand. The tour includes a small shark feeding demonstration and a hands on touch tank for the kids. We would classify this attraction as a tourist trap with the exception being if you have small children. Even then the price should be half of what they actually charge. Admission is $15 for adults and $8.50 for children. You can save a few dollars by purchasing your tickets online. They are located on Whitehead Street next to Mallory Square. One useful travel guide you may also want to check out when making your vacation plans is the popular travel site, Trip Advisor. Another great pointer is to consider is a condo rental . You may find that a vacation rental is a much better value than a hotel depending on the number of vacationers in your party. 2 & 3 Bedroom Beachfront Resort Accommodations in Key West Florida! Be sure to check out our Key West restaurant guide with reviews before venturing out.